Well, now we know why they waited a week. National Rifle Association CEO Wayne LaPierre just announced that guns are basically the only thing not responsible for the killing a week ago of 26 people, 20 of them small children, at an elementary school in Newtown, Connecticut. Against past experience as well as just basic common sense, it doesn’t even consider that working to decrease the number of guns, particularly dangerous guns, in circulation—via new bans, taxes, regulations, buy-back programs, and more—could possibly be the answer. LaPierre: "Politicians pass laws for Gun-Free School Zones. They issue press releases bragging about them. They post signs advertising them. And in so doing, they tell every insane killer in America that schools are their safest place to inflict maximum mayhem with minimum risk." Reality: LaPierre’s logic ironically follows that of the video games he elsewhere condemns: that evil killers are simply looking to maximize their body-count. If that were true, and if "Gun-Free School Zones" were the best way to accomplish this mission, we would actually have seen a lot more school shootings than we have. In fact, most American mass shootings have not taken place at “gun-free” day schools, the notable exceptions being the 1999 Columbine massacre and the shooting earlier this year at a Cleveland school. In those cases, the shooters were current students there; in Newtown’s case, the shooter was a former student. Meantime, mass shootings have taken place in such gun-heavy areas as a political rally in Tucson, Arizona (where concealed carry is legal) and on a military base. In sum, all evidence suggests that killers choose their victims according to metrics other than “safest place” and “minimum risk,” a notion confirmed by the fact that suspected Newtown killer Adam Lanza ended his spree in the least safe, riskiest way imaginable—namely, by killing himself. LaPierre: "And here's another dirty little truth that the media try their best to conceal: There exists in this country a callous, corrupt and corrupting shadow industry that sells, and sows, violence against its own people. Through vicious, violent video games with names like Bulletstorm, Grand Theft Auto, Mortal Kombat and Splatterhouse." Reality: Let’s see how much media attention Quentin Tarantino’s forthcoming, and reportedly violent, Django Unchained receives, and then maybe reassess the claim that the media try to conceal violent video games, movies, and the like. As for LaPierre’s subsequent contention that such media is responsible for the epidemic of mass shootings, this jibes neither with the fact that such media exist in plenty of countries without our epidemic (Canada, for instance) and with his own claim elsewhere that “our society is populated by an unknown number of genuine monsters—people so deranged, so evil, so possessed by voices and driven by demons that no sane person can possibly ever comprehend them.” By his own reasoning, then, violent media have nothing to do with motivating these people. 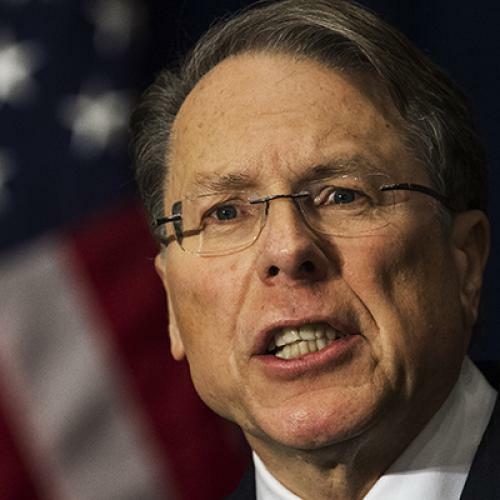 LaPierre: "The only thing that stops a bad guy with a gun is a good guy with a gun." Reality: This might be the most accurate thing LaPierre said. Contra other conservatives, who have urged children to bum-rush the adult carrying the semi-automatic, this is in most cases true—it’s why Secret Service agents are, indeed, armed. What that sentence cowardly elides is that in most cases a good guy with a gun is not sufficient to stop a bad guy with a gun. One such good guy might be the armed guard who was at Columbine. LaPierre: "With all the foreign aid, with all the money in the federal budget, we can’t afford to put a police officer in every school?" Reality: LaPierre’s actually right about this, too. There has been absolutely no pressure, at all, to cut down on the amount of money the federal government presently spends, least of all from people like NRA board member Grover Norquist. And anyway, if funding police officers in each school is too expensive—Matt Yglesias estimates it would cost well more than $5 billion a year—then there’s no reason we can’t at least start planting new money trees now. LaPierre: "But what if, when Adam Lanza started shooting his way into Sandy Hook Elementary School last Friday, he had been confronted by qualified, armed security? Will you at least admit it's possible that 26 innocent lives might have been spared? Is that so abhorrent to you that you would rather continue to risk the alternative?" Reality: It’s possible. It’s also possible that that qualified, armed security would have been the second fatality of the day (the first was Lanza’s mother, who, as we know, owned guns). It’s also possible that the qualified, armed security, in the heat of the moment and firing at close quarters, would have shot the wrong people—much like New York’s Finest during the Empire State Building shooting earlier this year. So, in sum: Yes, it’s possible, but it’s not probable, and there is probably a better alternative to discouraging future mass shootings. LaPierre: "I call on Congress today to act immediately, to appropriate whatever is necessary to put armed police officers in every school—and to do it now, to make sure that blanket of safety is in place when our children return to school in January." Reality: Putting hundreds of thousands of guns in hundreds of thousands of new hands would require careful vetting to make sure that none of those hundreds of thousands of guns fall into the wrong hands. So clearly we should do that as hastily as possible. Also, speaking of appropriating, wouldn’t lots of that new federal money go to gun manufacturers and sellers? The ones who fund the NRA? Could that have anything to do with this new proposal? LaPierre: "We need to have every single school in America immediately deploy a protection program proven to work—and by that I mean armed security." Reality: Where is the proof that armed security is the optimal protection program, or even that it works at all? Should we be surprised that the National Rifle Association is jumping to the conclusion that guns are the answer to our gun problems? The buzz phrase for describing the decline of the right is “epistemic closure.” Essentially, it is what happens when you only talk to other people who agree with you, and you all end up agreeing on an internally coherent set of facts and values that, objectively, are totally insane. Today’s press conference will provide an excellent case study for future generations.